Alpena, Mich — The Alpena Public School system is just one step away from raising funds to renovate buildings in the district. With facilities deteriorating and security systems needing improvement, Alpena Public Schools is hoping to get a bond proposal approved. Superintendent of schools, John VanWagoner, explained the process. “In our board meeting last month the board voted to place that on the ballot. It first had to go through an approval process through the Michigan Department of Treasury, and once the board received that, the board voted to put it on the May 7 ballot. 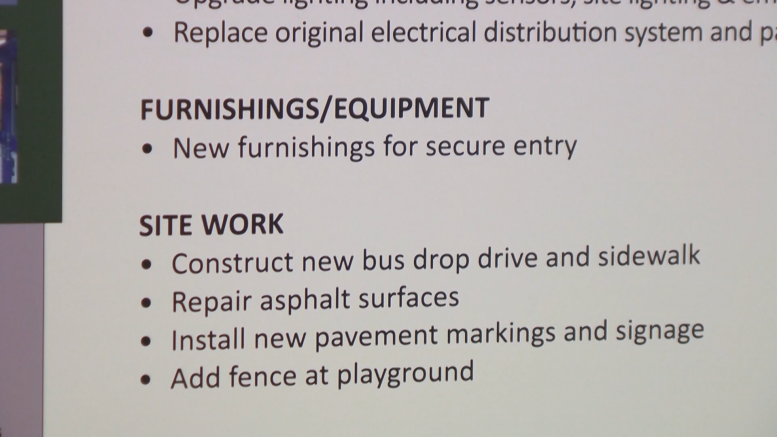 If the proposal is approved by voters, the district plans to tackle a number of projects, with student safety and infrastructure repair taking top priority. Community members concerned about costs associated with the bond will be able to see exactly where their money is going. The superintendents says the amount residents will pay, will depend on property taxes. VanWagoner says community members who want to learn more are welcome to reach out. “We want to make sure we’re going out and presenting all over the community. There’s fact cards that are available here at our office as well as on our website. If you go to AlpenaSchools.com on the right on the home page, there’s a check mark button you can click and [get] all the information including frequently asked questions are there that people can go to, or they can ask any principal in the district, or they can contact me here at central office at 358-5040 and I’d be happy to answer any questions anyone might have. The bond proposal will be decided by residents of Alpena and Alpena Township on May 7th. Alpena County Library Celebrates National Library Week!